Sonchus palmensis from the Annie’s Annuals catalog. Jimi Blake’s slide of this plant reminded me of seeing this plant growing in the San Francisco Botanic Garden in Golden Gate Park. It was a standout and prompted me to immediately start looking for it. Annie’s Annuals carries it and I discovered that it was a zn 9b plant, cooling my ardor somewhat…still…..I returned a couple years later to the Botanic Garden, rekindled my interest and made a stop at Annie’s on our return trip to home, but it wasn’t available, so it went back to my wish list. Then Jimi’s presentation at the Seattle Study Weekend moved it up in the queue. I am most familiar with the species of Sonchus that are weeds. I have pulled more than my share of Annual and Prickly Sow Thistle, Sonchus oleraceus and S. asper, but like many genera Sonchus contains several plants of horticultural merit. 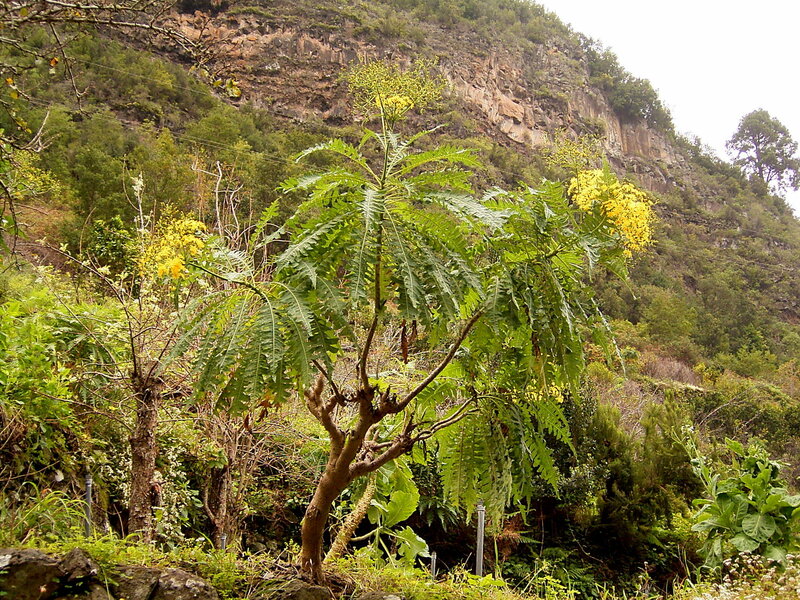 Most Sonchus are annual species, a few are perennial and fewer still are ‘woody’ species all of which occur on the Canary Islands alone, like Sonchus palmensis. This shows S. palmensis growing on its native La Palma, where it is endemic, the landscape almost lush growing in the young volcanic soil with plenty of basalt. There’s an Aeonium growing in the foreground and a terraced area above with a row of bananas growing in it. There are 19 different species of ‘woody’ Sonchus on the Canary archipelago. Five of the seven islands contain at least one of these species as a local endemic. Fuerteventura, the closest of them to Africa, is around 60 miles from Morocco, and is the oldest of them at nearly 21 million years. The islands are spread along a line westerly, each having arisen volcanically, each one younger than those to its east, the most westerly, El Hierro, forming less than a million years ago. Genetic researchers believe that based on their studies, these woody Sonchus species are all descendants of a single colonization event which then spread from island to island in a process of speciation and radiation. Genetically, the plants are very close especially when compared to other flowering plant genera and this is consistent with the isolation found on smaller islands around the world. It is interesting to note that eight other species are also closely related, but are within other genera. A few of these can be found on the island of Madeira, about 250 miles north of the Canary Islands and the Cape Verde Islands, an archipelago about 350 miles off of the coast of Africa and nearly 1,000 miles SW of the Canary Islands. All of these have taken a very similar evolutionary pathway, though their forms and the environment within which they naturally occur, are sometimes quite different. This group forms what is recognized as the Woody Sonchus Alliance. Such alliances are fairly common on archipelagoes. These remind me of the ‘woody’ Tree Lobelias that are endemic to the Hawaiian Islands, an alliance of 125 species including several genera. There, Lobelia are thought to be amongst the earlier plant arrivals and through a similar process of speciation and radiation evolved into the unique and diverse species we see today, in their cases, several of which are threatened. 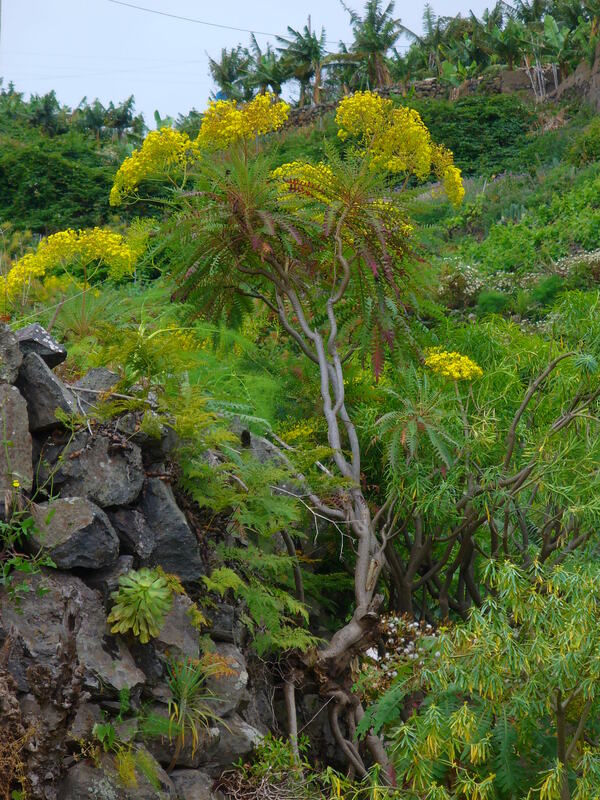 Sonchus palmensis is endemic to the the single island of La Palma, which at only 1.5 million years is the second youngest of the seven Canaries. Three other members of the Alliance can be found there. It occurs around the entire island growing at elevations up to 3,300′, often on quite steeply sloping and rocky terrain, though its most commonly found on the eastern side. Pictures will show this growing out of rock piles suggesting that they will want very good drainage. Because they are quite common on La Palma they are listed as ‘of least concern’ by the IUCN. The stems grow up to 6′ tall, branching irregularly on mostly bare stems. The foliage is very similar in form to that found growing around the rosette of our local annual Sow Thistle, on this species forming leaves closely attached to one another near the terminals of each branch, giving the plants what some would term their gawky appearance and others would describe as ‘Dr. Seussian’. At flowering, a many branched inflorescence forms at the terminal carrying typical Asteraceae heads often described as ‘Dandelion like’, each floret, including all of the center disk florets, being ligulate with their two fused elongated petals and three diminished ones. Sonchus palmensis from Annies Annuals here growing on a drier site. The climate on La Palma is very mild, sub-tropical oceanic, with remarkably consistent average temperatures around the year. La Palma the youngest, most westerly island, is less influenced by the heat of the African continent than are the other, nearer islands. It also has very little flat plateau area and consequently is wetter across the majority of its surface than the other islands. Temperatures tend to cool with elevation, the warm moist air rising against the mountain sides and cooling, the moisture condensing and falling as rain. Broad flatter terrain tends to warm more and clouds can sail over. Overall this is the ‘greenest’ of the seven islands. Keep in mind that while most of the rain is received in winter months, fog and heavy clouds often form around the mountains during summer, both cooling and adding moisture through condensation. This can be grown well outside in the Bay Area with its moderated summers. 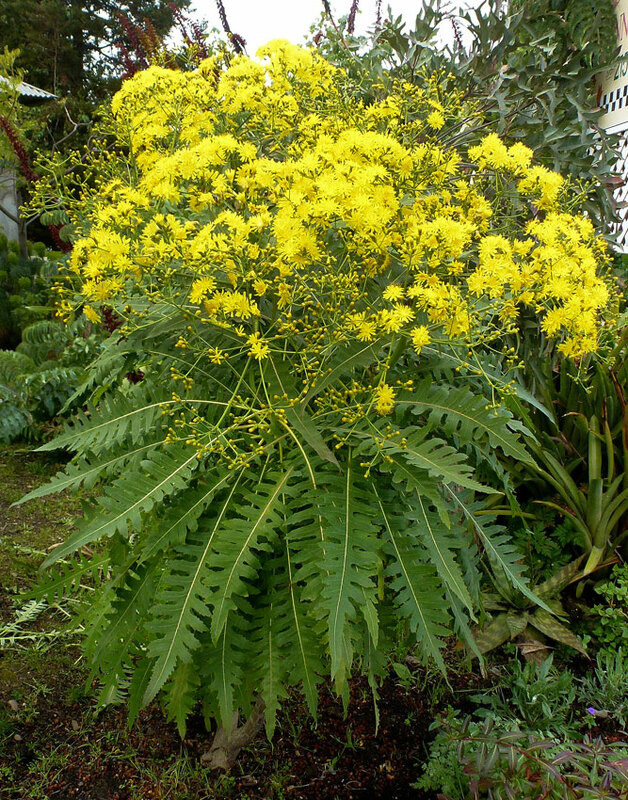 Sonchus, as a group, will grow best in full sun and are tolerant of summer drought conditions though S. palmensis may be more dependent on regular water than the other species. In California, Sonchus canariensis, is considered to be drought tolerant. Understand that this latter species is native to Gran Canaria and Tenerife, both more easterly, warmer and drier. These are considered to be hardy to zn 9b, down to 25ºF, some suggested colder, as one might expect coming from the Canary Islands where it can rub plant ‘shoulders’ with other natives like several Aeonium spp., Echium wildpretii and several Euphorbia spp. How many zn 9b plants does one need in a zn 8b garden? Well, for me it depends on its gifts, what it offers the garden and how it measures up to the other plants I’m already growing that require me go the extra mile. This plant brings a lot to the garden table. For now it goes into the queue. This will take our summer heat in Portland. I can picture growing it successfully on my front porch in a large pot where it will be shaded from the hottest part of the day, late afternoon…and it goes without saying, in a well drained mix with regular summer water! It would add a touch of humor to my xeric front garden with its strong architectural form looming from on high. Sonchus canariensis is another choice member of the Alliance. Check out this page on the Strange Wonderful Things. This entry was posted in Uncategorized and tagged Canary Islands, Sonchus palmensis on November 18, 2018 by gardenriots. Hmmm….I wonder if it has a summer dormancy in situ? I didn’t read anything that suggested such. The Canaries do have a mediterranean climate with dry summers and many parts of them are drier overall than we are though S. canariensis tends to occur most often on eastern facing slopes, morning sun, not the hottest locations. I haven’t seen a map of preferred areas, but one source says they tend to occur in barrancas, or steep ravines where they may be even more protected and shaded from the afternoon sun. On Tenerife the summer high temps seem to average close to ours as they are moderated by the surrounding ocean. You grow yours in a pot, which will increase the soil temperature in summer. 85ºF seems to be a cut off for a lot of plants in terms of conditions under which they best grow…above that and their metabolic processes may be disrupted. I wonder if the summer deciduousness your plant experiences is a heat response? S. palmensis comes from the island of La Palma, further west, further from the continental effect of Africa, and with both milder temperatures and significant moisture even in summer from cloud condensation….I wonder if all of these do better in maritime climates? Or, would they perform better planted in the ground here, during summer, shielded from the highest temps with cooler roots, and then dug in the fall for winter protection? Plants that have C3 and CAM photosynthetic metabolisms are better adapted to hot and dry conditions. Two other ‘random’ observations, one of the pictures I posted shows an Aeonium growing near the base of a Sonchus palmensis. Aeonium do better for me protected from the hot summer sun. Perhaps them growing together suggests they would both prefer that. Also, when I see pictures of Echium spp. growing in the wild there they seem to occur on more exposed, drier, sites, these don’t seem to be companions though they are both Canary Islands resident endemics. Just an FYI that my Sonchus canariensis goes dormant in the summer, reliably, every year. Don’t know that a S. palmensis would be the same but it’s something to consider if you’re planning on it being a summer star. Mine looks great right now, and will look it’s very best in the early springtime. Come July and August it’s just a pretty, branched, stick.